I associate fall with picking apples and enjoying all those apple-related treats – apple cider, apple squares, apple jelly and, of course, the apples themselves. As part of my celebrating of fall and apple picking, I will be giving four public readings of my book over the next couple of weeks. Since my book ‘within easy reach’ is about eating local foods, my readings will focus on my memories of the apple harvest and trips to local orchards. I make a selection of the poems I will read. 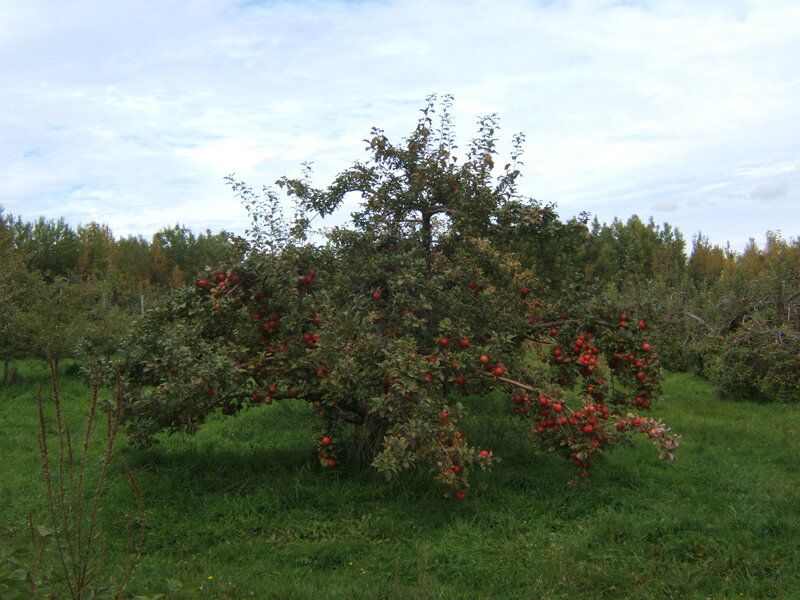 For the first two readings, I’ll select poems about apple picking – this is the time when New Brunswickers visit local orchards to get the best fall apples! I mark my book with post-it tabs so I can find each passage easily. I make a few notes about how I want to preface each poem. I put the notes on other post-it tabs right on the page. Some poets don’t like to preface their reading – I like to say something about each poem since I like to prepare the listener. I practice my readings aloud, including my preface comments. Practicing helps me time the presentation and work out phrasing and emphasis. I do some promotion for each of the readings – posting on my blog, on Facebook and Twitter. For the Authors Coffee Hour I also have a poster to put in a couple of local places. I love to read in public. Sometimes I worry a bit about audience response and the possibility I may stumble on delivery. But, if I am well prepared, I can relax, take three deep breaths and enjoy reading my words aloud. As I prepare for my fall book and art sale, I have tried to bring some of my pencil drawings into acrylic-world. One of my favorite covered bridge drawings depicts a tree of green apples against the backdrop of the Malone Covered Bridge near Goshen in Kings County, New Brunswick. The Malone Bridge crosses the Kennebecasis River where it is hardly more than a stream. From this drawing, I have done ‘apple tree, Malone Bridge’. I think this is my personal favorite of all the paintings I have done. The painting is acrylic, 18″ X 18″, gallery edges, using Paynes Grey, Ultramarine Blue, Cadmium Yellow, Titanium White and Burnt Sienna. Thirty years ago, we planted a young Wolf River apple tree in our side yard. I wanted to create an orchard where I could walk in the shade and gather fruit in fall. For years we took good care of the orchard – three apple trees and a cherry. In spring I have inhaled the sweet fragrance of apple and cherry blossoms. In spring I watch the blossoms burst open like popped corn. I listen to the bees gathering their nectar. Watch the apples ripen and grow. Some years I make apple jelly, some years applesauce. In the fall I watch deer under the trees, eating their fill of apples. One year a deer challenged me for ownership of the Wolf River tree, pounding his hoof into the ground with a loud, reverberating stomp. A few years ago, our interests turned to other things and the orchard was left to go its own way. The cherry tree continued to bloom but produced no cherries because it is ‘self-unfruitful’ and needs another cherry tree. Two of the apple trees succumbed to the shade and died. The Wolf River tree survived, but grew tall and gangly, trying to reach the sun that peaks over the roof of the house. Now, priorities have shifted. We are interested again in the ‘orchard’ and have plans for its future. In the next weeks we intend to cut down the dead trees. A friend has agreed to prune the Wolf River tree when the season is right, to bring its branches within reach. I will buy another cherry tree so we can finally have cherries. To seal the plan for the orchard, I have done a portrait of the apples as they grow plump in late summer. Painted in acrylics, 11″ x 14′, gallery edges, with Ultramarine Blue, Cadmium Yellow, Titanium White, Paynes Grey and Burnt Sienna. October has taken hold and now signs of autumn are everywhere. Color seems to be the theme… the orange of pumpkins and gourds, the yellows and reds of the maple leaves, and the red of ripe apples. On our way to the lake, we drive past orchards of apples. Most of the apples have been picked, but some trees are still laden with fruit. For me, the orchards are full of memories, of picking apples with my family when we were younger. I remember how much fun we had, my son and niece and nephew excited to be able to run free and pick the apples, and the adults thinking about the apple pie possibilities from those loaded trees.